Gone to Amerikay, the new Vertigo original graphic novel by Derek McCulloch and Colleen Doran, will have a book launch party, benefiting the Comic Book Legal Defense Fund. McCulloch and Doran will both be at Harbor Lights Restaurant in New York City on March 30 from 6 to 8 pm, celebrating the release of their new book and demonstrating their support of the CBLDF’s mission. All are welcome to join the celebration; admission will be free, though donations to the CBLDF are suggested. There will be complimentary hors d’oeurves, and special guests from the comics community will be on hand to inaugurate Gone to Amerikay. Copies of the book will be on sale, courtesy of Midtown Comics. 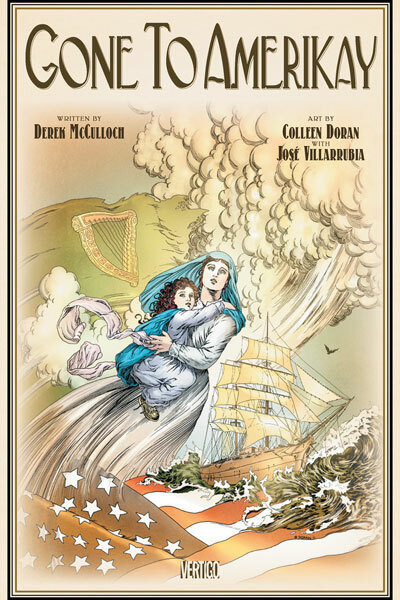 Hailed by J. Michael Straczynski as “THE book of 2012,” Gone to Amerikay is a century-spanning original graphic novel about the America that Ireland dreamed. 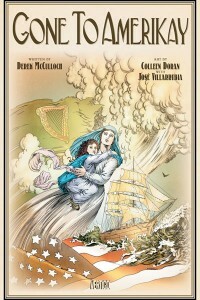 It tells the story of three generations of Irish emigrants to the United States: Ciara O’Dwyer is a young woman raising a daughter alone in the Five Points slums of 1870; Johnny McCormack is a struggling actor drawn to the nascent folk music movement in Greenwich Village 1960; and Lewis Healy is a successful Irishman who’s come to present-day Manhattan on his wife’s anniversary-present promise to reveal the connection between him and them. The mystery originates with Ciara’s runaway husband, who disappeared after promising to join her in America, and carries into mid-century when Johnny, devastated by an unexpected romance and a lost shot at musical fame, gets a supernatural visitor. Gone to Amerikay will be in stores on March 28. The Comic Book Legal Defense Fund was founded in 1986 as a 501 (c) 3 nonprofit organization dedicated to the preservation of First Amendment rights for members of the comics community. They have defended dozens of Free Expression cases in courts across the United States, and led important education initiatives promoting comics literacy and free expression. For additional information, donations, and other inquiries call 800-99-CBLDF or visit them online at www.cbldf.org.